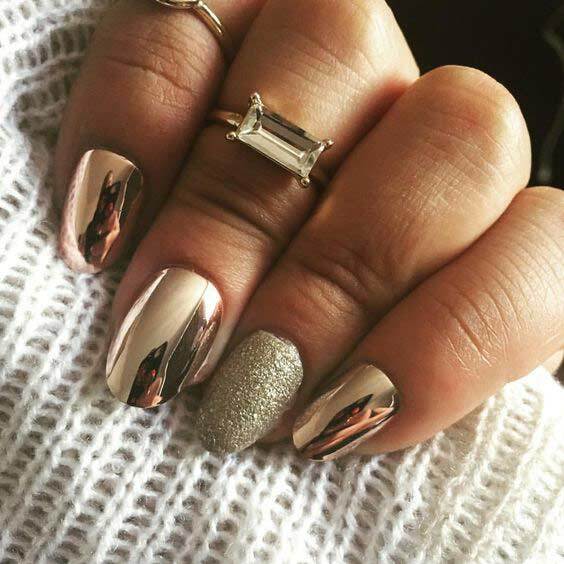 Because why wouldn’t you want to mix metallic nail designs with glitter? 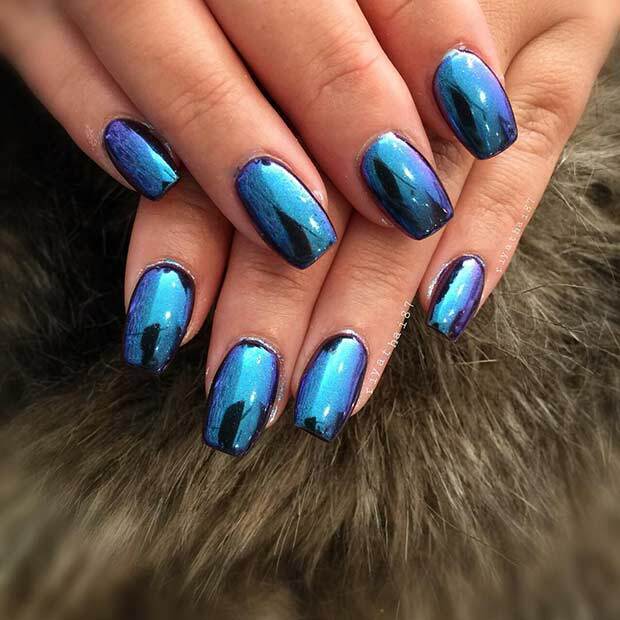 This edgy blue look is amazing, holographic, shiny, and super-fabulous all in one. We especially love the pink and purple ombre on the one nail. Selena Gomez recently rocked some rose gold beauties, proving once again that this edgy and cool style is definitely bang on-trend. 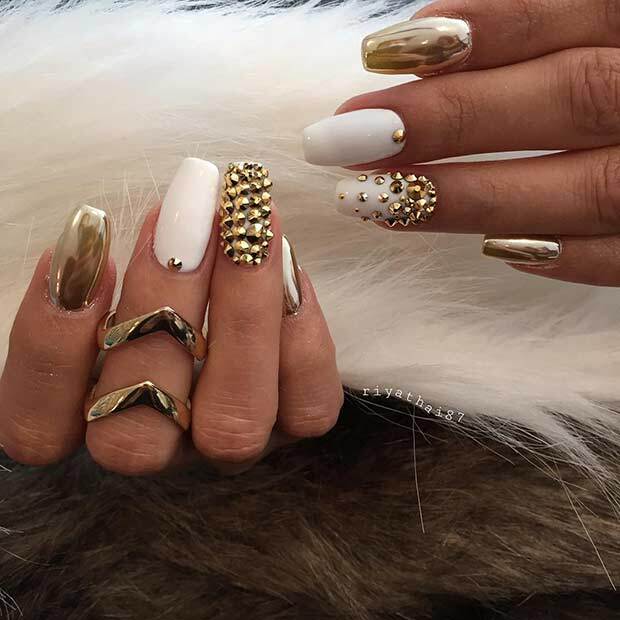 Even Kylie Jenner has shared with us her beautiful gold metallic designs. 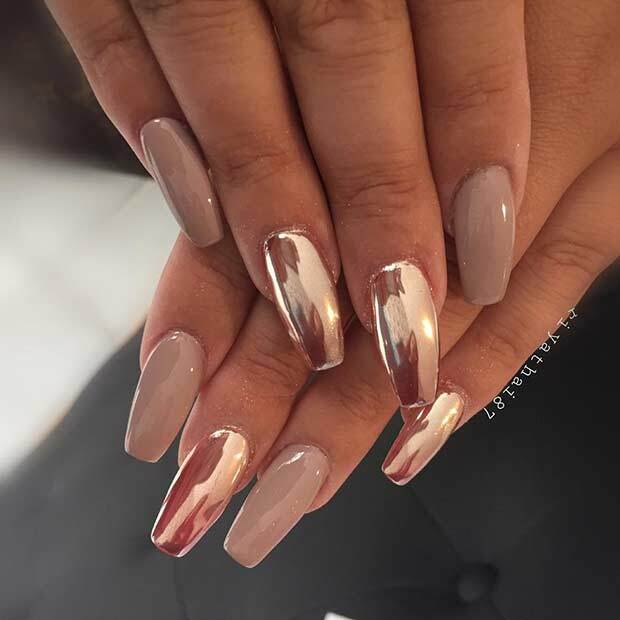 These metallic nail designs are known by a whole bunch of different names – chrome nails, mirror nails, shiny nails, you name it. They all have one thing in common though – they’re all super shiny. Oh, and we love them all, especially these matte green and metallic marvels! 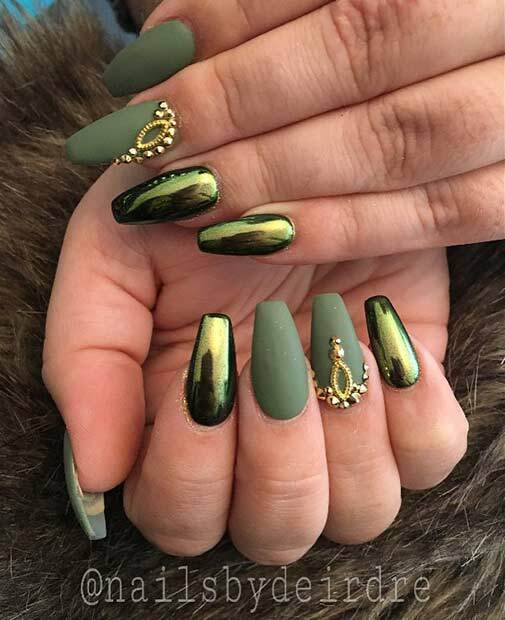 There are a number of different ways in which you can achieve these metallic nail designs, and some of the methods aren’t as difficult as you first may have thought. One of the messiest ways, although it seems, one of the best ways to get the results you want also, is to use a highly pigmented glitter powder, which is layered. 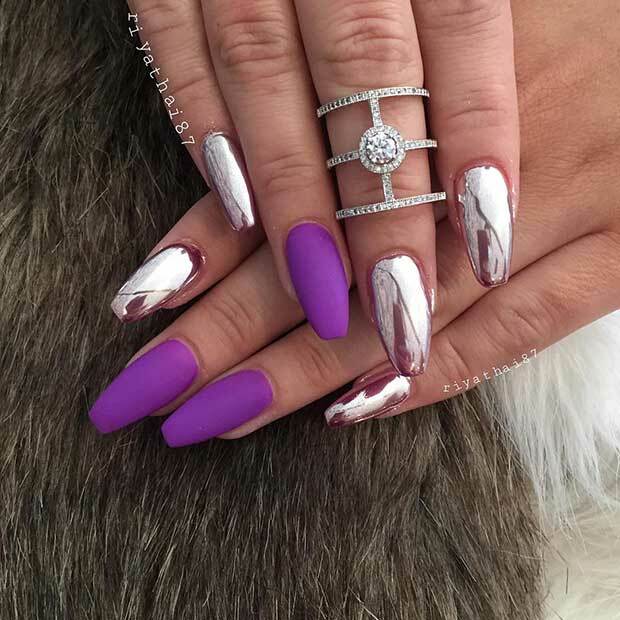 A chrome nail polish can also be used to create the same kind of look, and if you want to get even lazier than that (just like us), you should look at nail wraps. You simply place this over your nail, cut off the excess, finish with top coat and you’re done. It’s all nice and simple, and we really love nice and simple. 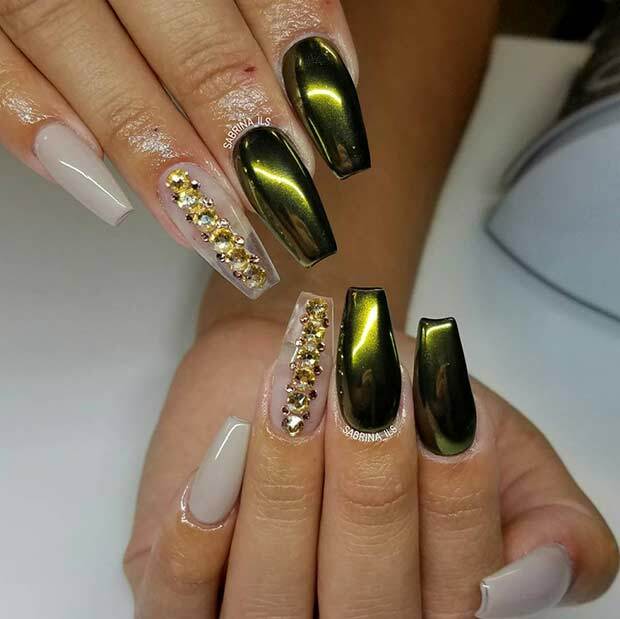 If you want to use the highly pigmented powder to achieve your metallic nail designs, you should be aware of how to do it properly. Watch tutorials online until you’re sure of what you’re doing, and if you’re opting for a nail polish, rather than the powder, ensure you invest in a good one. Cheaper ones have a tendency to run streaky, and this will destroy your super-shiny finish. 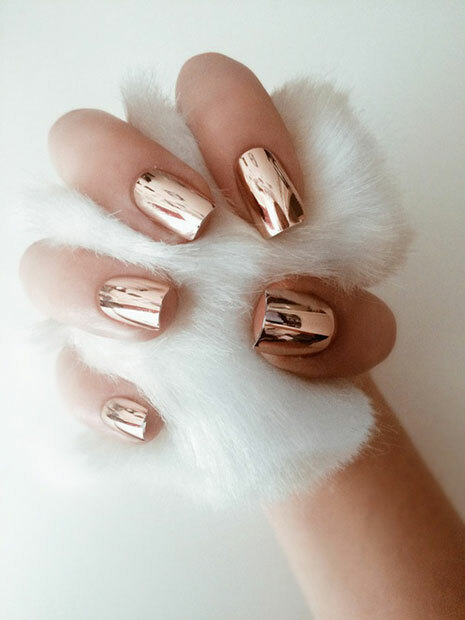 Do you know what works really well when you’re talking about metallic nail designs? Black and gold, that’s what, especially when the black is matte. We have some serious love for matte black, and thankfully black is a shade that never really goes out of style. What about when you don’t want metallic nails all over? 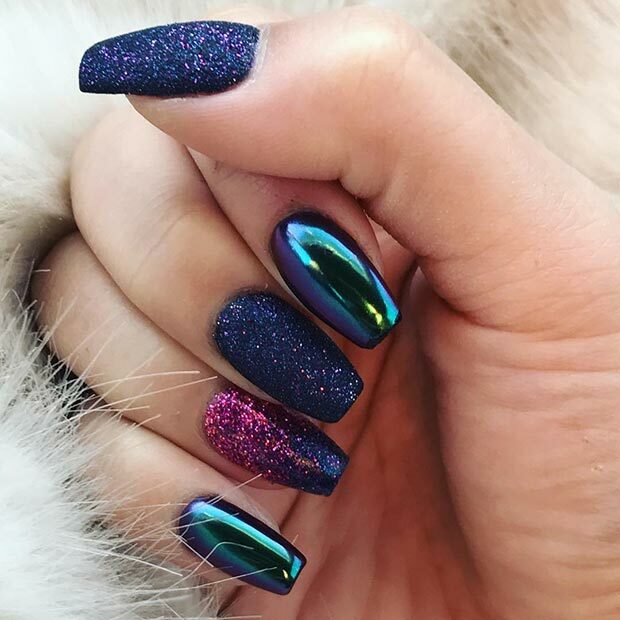 How about a metallic ombre tip instead? It certainly tickles our fancy, and we think it might just tickle yours too. You can easily use a triangular makeup sponge to dab on the area you want the more tip to start, adding more as you need to, to build up the look. The good thing about these metallic nail designs is that they come in a wide range of colours, shades, and even styles. 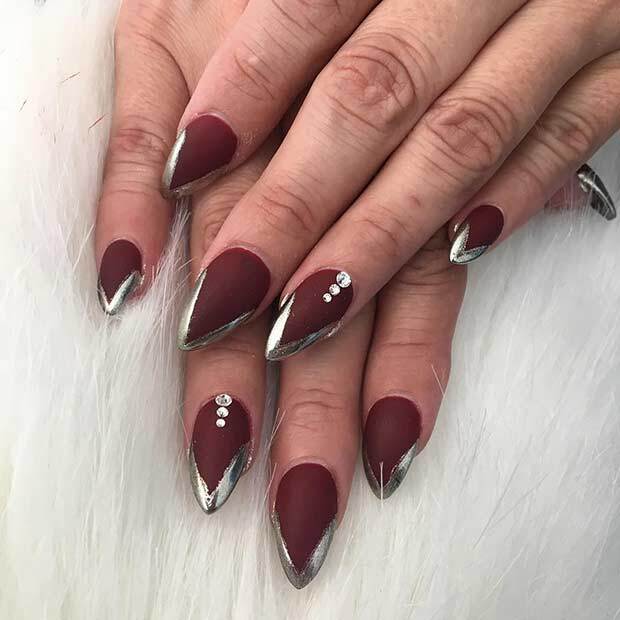 It doesn’t matter what event you’re planning for, there are metallic nails to suit every occasion, and you could even combine different looks – metallic and matte together, for example. 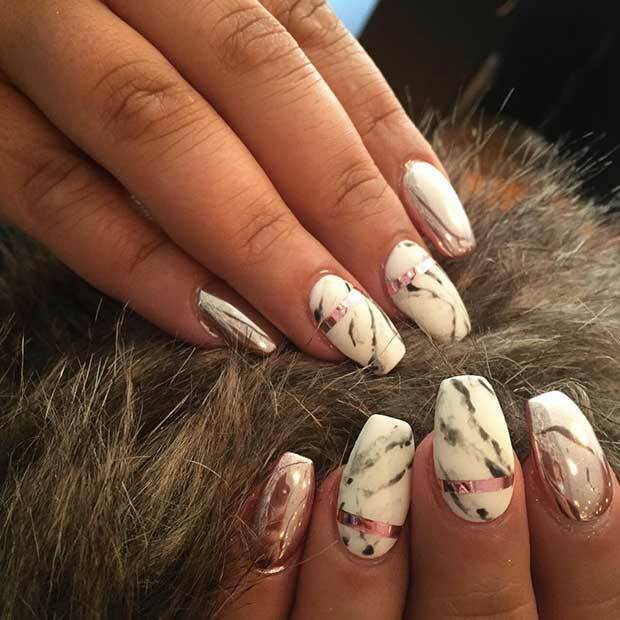 Marble nails are just as beautiful as the metallic nail designs we’re showing you here, and we love the way that one of this season’s hottest colours – rose gold – has been used with a marble finish to give you a super-sassy, yet very sophisticated and glamorous set of talons. What do you think about these bright pops of colour? 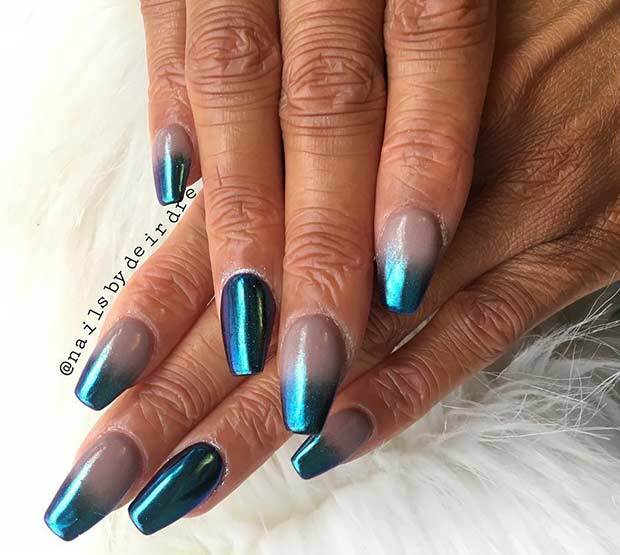 You could liven this look up with any number of shades too – bright blue for the featured nails, for example, and a beautiful blue / mirrored holographic finish for the rest? It’s one we’ve added to our to-do list. 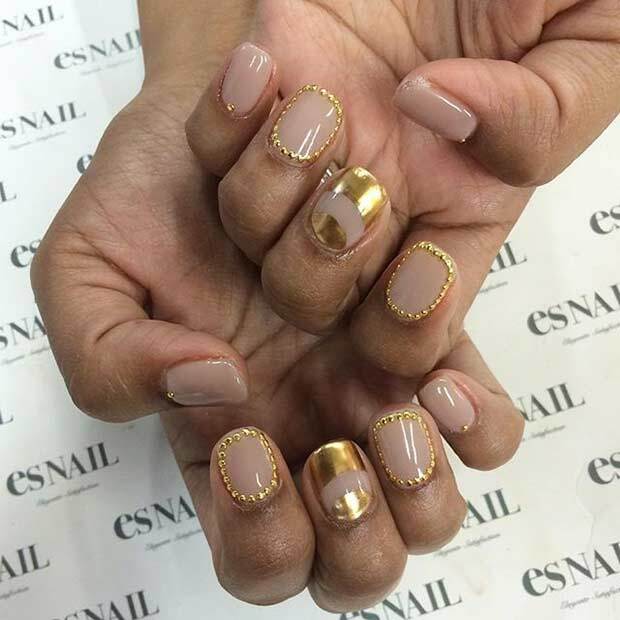 If you’re working with metallic nail designs in the form of nail wraps, make sure that you apply the wrap in the right way to give you that smooth surface. You should start with a base coat on your nails. Once that’s dried, grab your nail wraps and find the ones that best match your nail sizes and shape. Peel them off, place them on the nail, and then use your nail (lightly), or an orange wood stick to smooth it out. Use a nail file and your scissors to cut, and then file, the edges of the nail wrap away, and you should be left with your metallic finish. Add a top coat and you’re basically good to go. 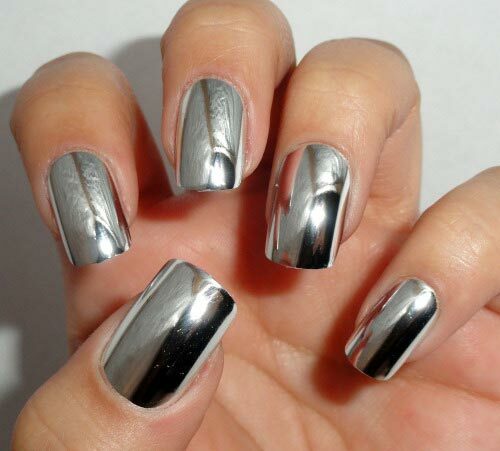 Before you begin trying to attempt any of these metallic nail designs, make sure your nails are clean to start with. This means getting rid of any old nail polish left over from your last manicure, and giving your hands a good wash. Sort your cuticles out, filed the nails into the shape you need, and make sure you have nothing left on your hands, not even hand cream. Did you know that your fingernails only grow about 1/10th of an inch every month? That’s not really a lot, and you’d be forgiven for heading to the nail salon for extensions. We do it enough … But you should take care of your nails if you are having extensions, and to start with, you could try using olive oil on your nails and cuticles in the place of your regular cream. Nail wraps are definitely one of the easiest ways to bag yourself metallic nail designs, and even if you’re planning on decorating over the top, at least you have a clean, smooth and blank canvas to start your masterpiece on. You’ll generally find the wrap will last for ten days, so they’re worth it. 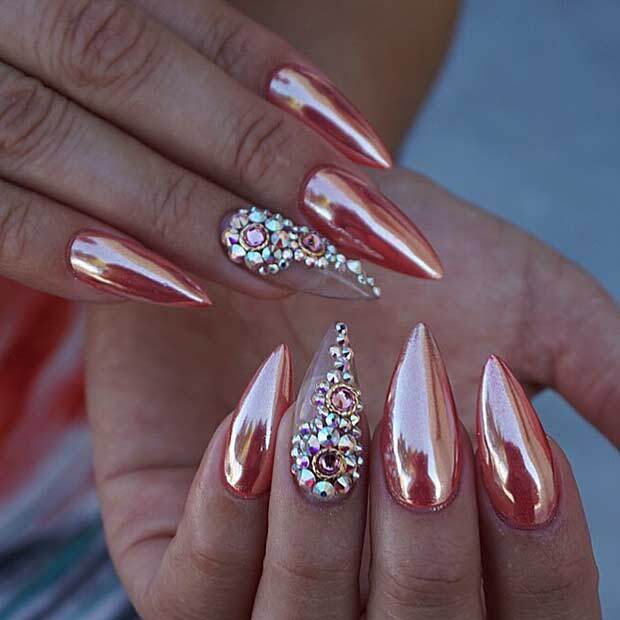 If you’re planning on using gems and rhinestone embellishments on your nails, here’s a handy tip you’ll need to know – always carry a little bottle of nail glue in your handbag or pocket. These little gems have a habit of falling off, right before a golden photo opportunity, and if you don’t want it to be ruined, have a spare gem and some glue to fix any mistakes. 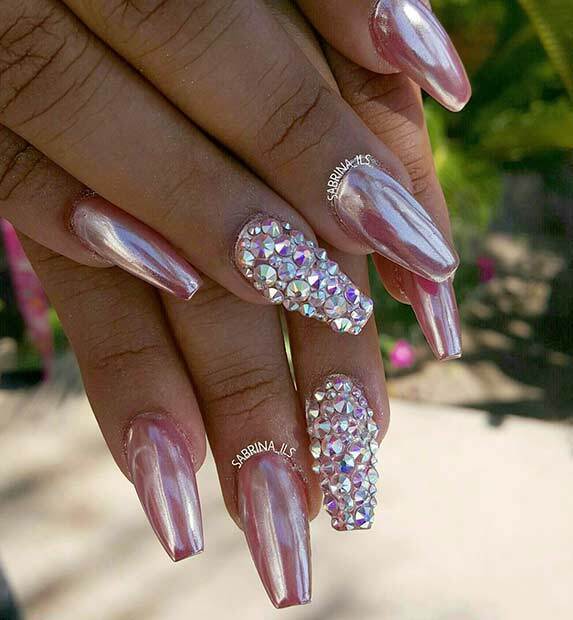 It takes a lot of time and dedication to fix those gems into place on top of your nails. That’s why having just the one ‘decorated’ nail is a great idea. The one featured nail often draws the eye towards it, meaning it has double the impact of lots of embellished nails. 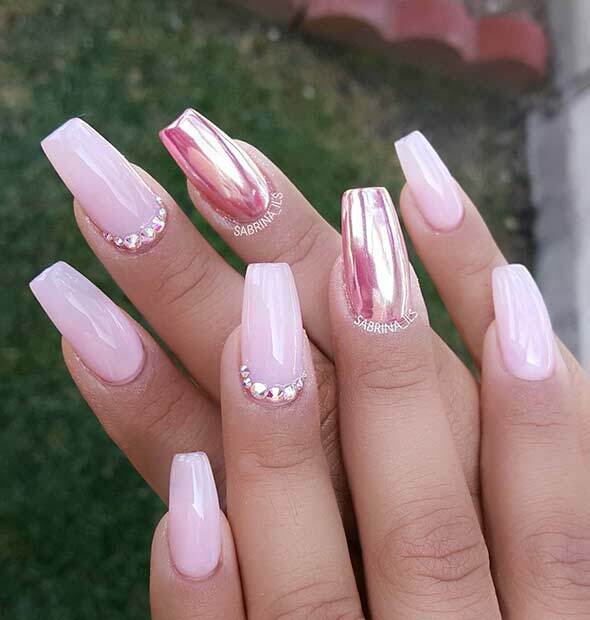 Against the beautiful pearly-pink metallic backdrop of the other nails, the contrast works wonders. Coconut oil is a great way to try and encourage some healthy nail growth. If you want to nails to grow, rather than relying on extensions, there are important nutrients in the coconut oil to encourage them to grow faster, stronger, and longer. There are also properties present in coconut oil which are said to help fight fungal infections, essentially killing two birds with one stone! Easy is good, right? 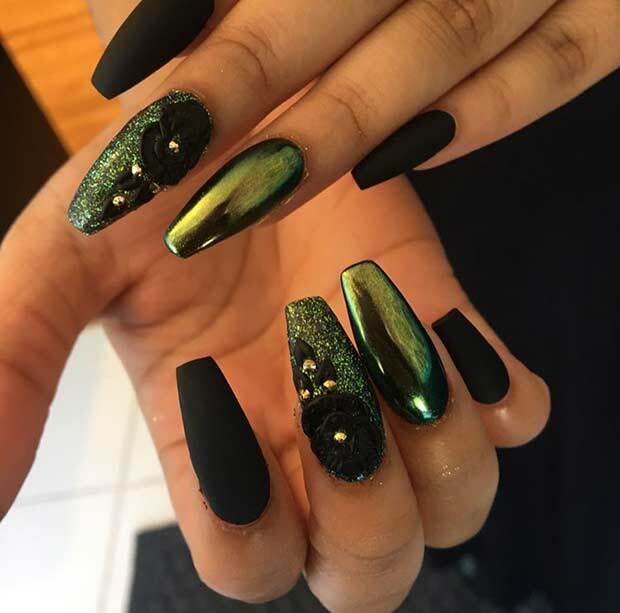 Coffin nails are an easier choice if you can’t handle those long and pointed nails. Have you ever tried to pick money up off the floor with those pointed nails? It’s impossible – we’ve found that coffin nails are much easier to handle. 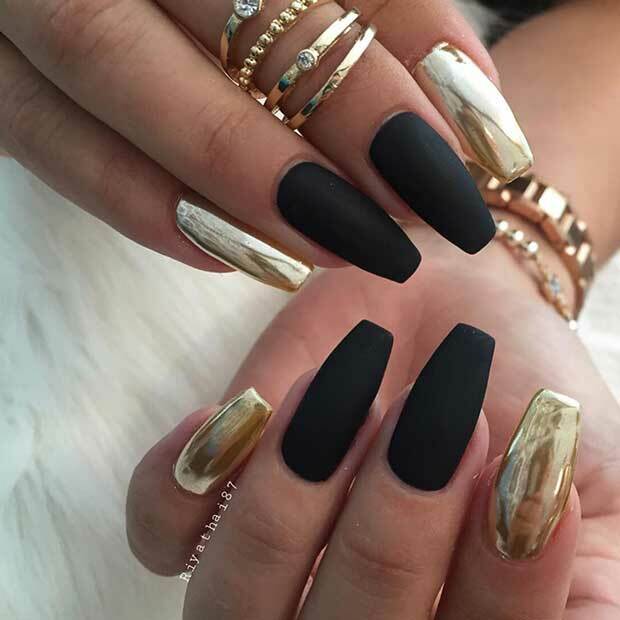 We’re just looking for an excuse to rock these dark gold coffin nails really. There’s no shame in that. 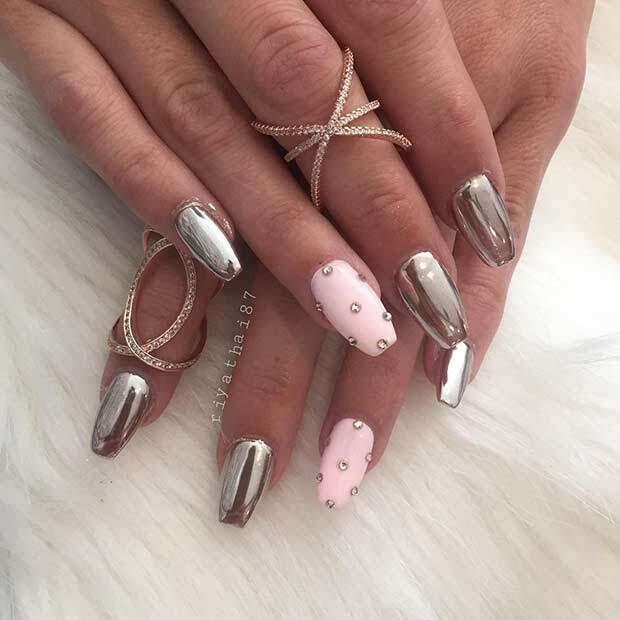 If you’re opting for nail wraps to get your metallic nail designs, you should make sure that you’re giving your nails a break every now and again. This is the same for nail extensions also. Your nail needs to breathe in order to grow healthy. If it can’t, permanently being suffocated by polishes, wraps, extensions, and other stuff, your nails will grow brittle and not healthy at all. If you find that your nails have a habit of going a weird yellow colour once you’ve had a darker shade polish on them for a few days, you can battle it with some lemon juice. Simply use some lemon juice on a cotton wall pad or ball, and wipe it over the nail once you’ve use acetone-free nail polish remover. 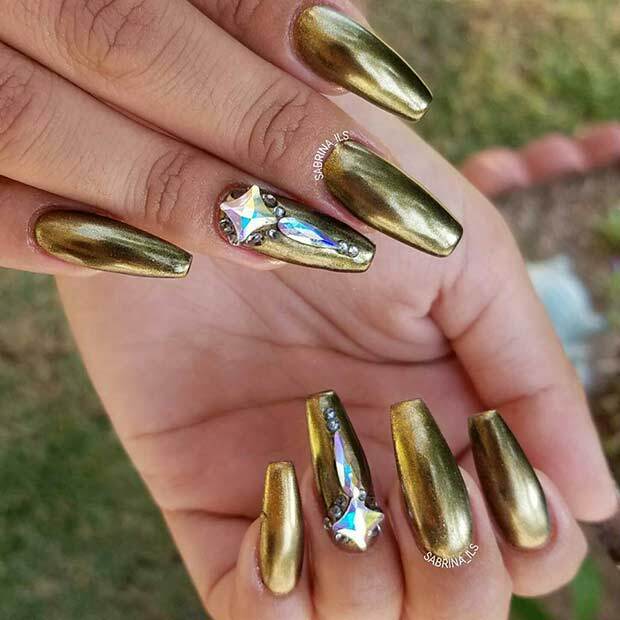 We hope that these metallic nail designs have given you plenty of inspiration, but we can’t wait to see what beautiful creations you come up with. Add gems, different textures, make them long, short, sparkly as you like, but make sure you show us! Give our social media pages a like to send us your designs.